Extra strong - extra soothing cough relief. 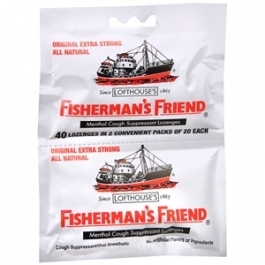 Fisherman's Friend is renowned around the world. Discover its power in fighting coughs, soothing sore throats, and helping nasal passages feel cool and clearer. No Artificial Flavors or Ingredients. Adults and Children 2 Years of Age and Over: Allow 1 lozenges to dissolve slowly in the mouth. Repeat every 2 hours as needed or as directed by a doctor. Children Under 2 Years of Age: Ask a doctor.